There is no doubt that the biggest advantage of having a pergola over your deck is the expansion of the living space. This is what your custom decks will actually do. The job of the pergola is to ensure you get to stay outside as much as you want without a care in the world whether it rains or not. Yes, the pergola is not like a wooden gazebo which has a full roof. Pergolas are defined by their wooden beams and so only make a light shade. But this is often all you need in the summer. And then again, you can use plants or throws or awnings to cover the little gaps created between the beams. 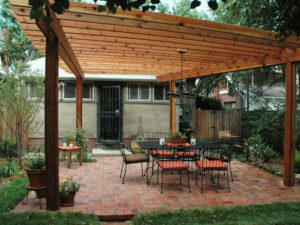 Things you can do with your custom pergola have to do with its size, location, color, and design. Although pergolas are installed mostly over decks in patios, they can also stand-free. They can become your shelter near the pool or barbeque. The sides of the pergola might be free of pillars but alternatively, you can have a wooden fence acting as a wall on one side to increase your privacy. This fencing option can be made out of wooden boards or cut-out panels. 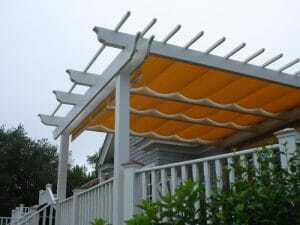 There are literally hundreds of ideas when it comes to pergola designs and colors. The great thing is that you can use the beams to hang your deck lighting, cover with ivy, place Christmas decorations etc. When your wood pergola and deck decoration designs are endless, you also find more ways to spend time outdoors. You will have a good reason to step out during Christmas, invite friends for dinner during the summer, start gardening, enjoy the pool, and escape for practically all reasons in a protected area. Not to mention that the combination of a matching cedar custom deck & pergola will make the best scenery outside your window and will blend nicely in the natural environment of your landscape. So, thumbs up for such outdoor structures and the perfect marriage of pergolas & decks.